What’s so special about a bunch of guys growing moustaches? Let me tell you. I’ve heard about Movember the past few years, but I haven’t paid much attention to it. But the buzz seems to be getting louder this year, so I looked into it. If you haven’t heard about Movember, it’s a fundraising movement in which men grow moustaches for the 30 days of November to help “change the face of men’s health.” It began in Australia with about 30 people participating in 2003 and last year had more than 850,000 men who raised over $125 million in 2011. Having worked in the health care industry for many years, I can tell you it’s difficult to get men to get more involved with their own health care. Movember raises awareness and gets men involved in a fun, silly way. October is pretty much painted pink with breast cancer awareness events. Even major sports leagues get involved by wearing pink and using pink-colored sports equipment like bats, gloves and cleats. 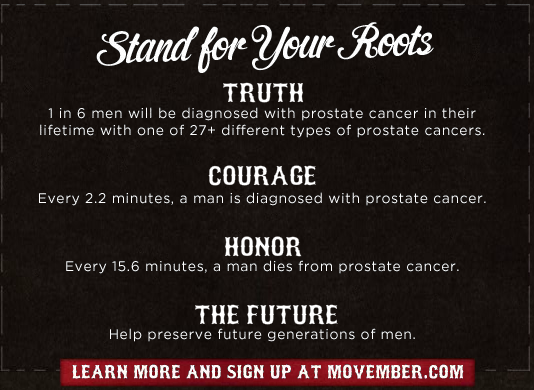 Why not then devote November to raising awareness of men’s health issues like prostate and testicular cancer? It’s a fantastic idea! Men around the world are growing their moustaches in this month, some hilariously in vain and some bushy as all get-out. I spotted a bunch of newly grown moustaches in NFL games this past weekend. And even The Office characters participated and talked about it on a recent episode. This is one movement/event that truly understands its audience—the same audience that likes to grow out facial hair all through playoff season for their favorite sports team. They would not have responded as well to a different colored ribbon. Like the simplicity of Livestrong’s yellow rubber bracelets, Movember’s moustache-growing fun is pure genius. And, true success is that these men really are talking about and taking care of themselves better. Check out the Movember website, and while you’re there, feel free to stop by my friend Ryan’s page and help him out. Looks like his moustache is finally filling in. Yes, it’s the week of Thanksgiving—a great time to reflect upon all that we are thankful for in life. Just the other day, I was thinking about the wonderful people I met through social media—through Twitter and Meetup.com. If you’re interested in digital marketing, social media, podcasts, webcasts and even yoga, you’ll like meeting these people too. Philly Marketing Labs—First, I met Skip Shuda and Bechara Jaoudeh (founders of Philly Marketing Labs) at their Main Line Internet & Social Media Marketing Meetup. A few months later, Skip asked me if I was interested in working with them, and a while later, I began working with them on a regular basis. These guys introduced me to the world of entrepreneurship (Bechara also owns BagelSpice), which really rejuvenated my career and opened up all sorts of options for me. They are SEO and digital marketing experts and they regularly share their knowledge with others. To them, I am forever grateful and I look forward to working with them again. Through Philly Marketing Labs, I learned about and started volunteering with the nonprofit TechGirlz, which helps middle-school-aged girls get interested in and stay interested in tech. See founder Tracey Welson-Rossman’s recent interview for a quick look at the group. I liked the Main Line Social Media group so much, I found another marketing meetup just starting up in Chester County a little over a year ago. The Chester County Marketing Group was run by Ryan Gerardi and Jeff Tincher, who immediately formed a core group of people (including me) to help keep the meetup group going. Ryan has unending energy and works at HookLogic to help the automotive industry better use digital media marketing tools. He now lives in Michigan but still stays in touch. He also liked my blog, so we ended up working together as I wrote some posts for his websites: AutoConversion and AutoConverse. You’ll also see him still contributing on the Board of Advisors and as a Technology Coach with the Business Vision Network. Jeff is a digital marketing know-it-all (in a good way! ), who seems to be on top of every new trend and channel that appears in the digital space. The nice part is he is always so willing to share and help others get up to speed as well–see his 610 Digital site. Another cool thing is that you’ll see he always lists “Dad” as one of his key roles. 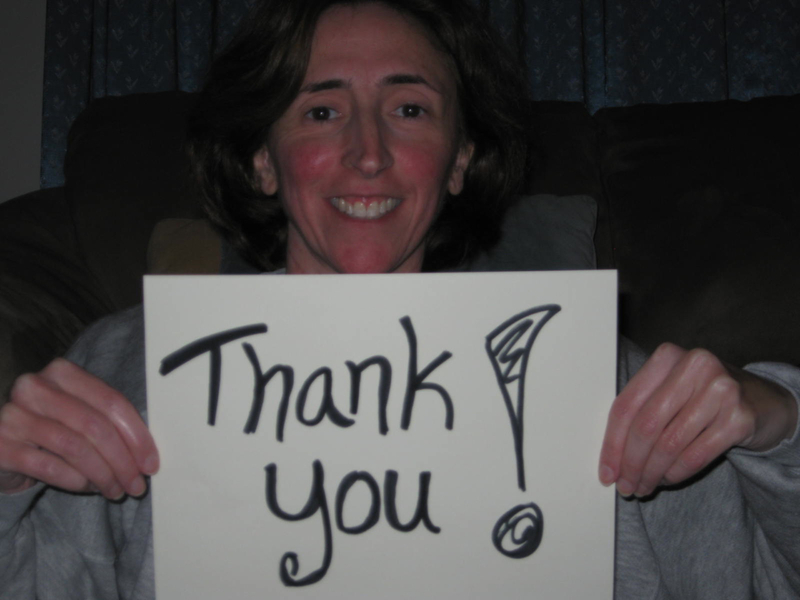 Carla Wilson is another fantastic person I met through the Chester County Marketing Meetup. She now co-organizes the group with Jeff, in addition to owning Wilson Media Services and being the president of the Delaware Valley Virtual Assistants Association. And she is a yoga teacher who recently put on the first Namas Day in Philadelphia. Check out the podcast/webcast she does with Mary Motz. I met Liam Dempsey through the Chester County Meetup too. 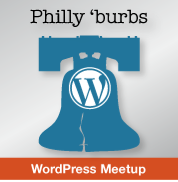 He runs his own marketing and design firm and started the Philly ‘Burbs WordPress Meetup group with me helping. He’s smart, funny and works hard, but always has time to talk to others. Visit his Chicken-Monkey-Dog site and you’ll get a sense of his personality and sense of humor. I have to mention Christina Strommer too—who, like me, just kind of stumbled upon these groups and keeps coming back. On Twitter, she’s @jamminpsu and describes herself as a “graphic designer/STEM advocate/gadget geek/literary junkie/music enthusiast. And a mom.” She is a friendly, interesting woman who is a NASA fanatic. I love learning from her too. One of the reasons I decided to write this blog post this week is that these people, with whom I got together to talk marketing and how to further our own businesses while helping other people, have become friends of mine. Friends I really enjoy talking with and hanging out with. I am so thankful for their presence in my life. Being connected with them has led me to all sorts of other fabulous connections, both meeting people in person and on Twitter. They’re too numerous to mention here, but I am so thankful for their friendship too. And I look forward to getting to know each one of them better in the new year. The holidays are coming—you know it, I know it. They’re coming fast. 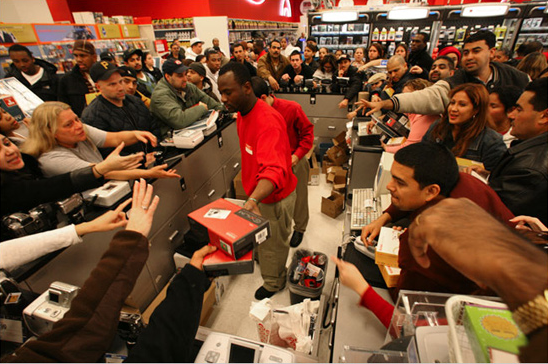 You may have already heard the news that Walmart, Target and others are opening at 8 and 9pm Thanksgiving night. Disappointing. I covered this last year and have not changed my opinion of this practice, so I won’t repeat myself. But really, must consumerism overtake the value of time spent with family and friends? For B2C marketers, this is a busy time of year. If you’re competing for customers, there are a ton of articles out there advising you on social marketing through the holidays. I recommend you read, “Why Social Media Marketers Should Shelve Holiday Hard-Sell.” See why holiday-themed promotions often perform worse than non-holiday promotions in terms of engagement. So, what am I going to write about today? What you can do now to reduce some of the holiday stress marketers cause. 1. Create a separate email address for all your online shopping. If you haven’t done this already, now is the time—before you start doing your holiday giving and shopping online. Retailers are about to flood your inbox with holiday promotional emails, making it difficult to find the emails you want and need to see. Make the switch and keep both boxes clean and easy to manage. 2. Unsubscribe from brands whose emails you’ve been deleting regularly. You do not need to spend any more time on email than you do already. So why not take time now to unsubscribe from all those brands and websites you’re really not paying attention to anymore. You know you’ve been meaning to do it. Why procrastinate any longer? 3. Do as much shopping as you can online…early! The earlier you can shop, the better. And really, as much as I enjoy shopping in actual stores, holiday shopping online is so much easier. No jammed parking lots with kamikaze drivers vying for that last open spot. Instead of driving all over or walking from store to store, you can simply go online one morning or night (maybe two or three) and get all your shopping done, shipped to you and even gift wrapped. Yes, you might save some money by waiting, but you save time and sanity by making your shopping convenient for you. Plus, you’ll have plenty of time left to pick out a treat for yourself, volunteer your time for a good cause or spend more time with friends. You don’t have to fall for the holiday hype. Live the holidays on your own terms. Retailers and marketers seem to be trying to take that away from you. It’s time to take it back. Good luck! May you have the holiday season of your dreams…instead of your nightmares. It’s time for the Gap to take a good, hard look at their social media marketing efforts. First, the debacle over an “insensitive tweet” during Hurricane Sandy, now a Facebook promotion that stirs up more questions and confusion than goodwill. Looks good, right? More than 4,300 liked and 202 shared. But click on the link and the problems begin. Notice anything yet? Here’s a sample of the comments left on the Gap Friends Event page. 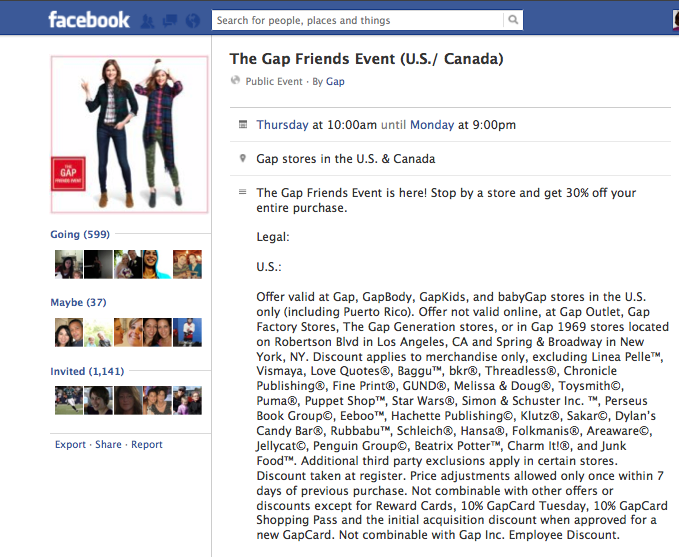 Here’s where I think the problem is: Instead of simply posting a promotional offer on their Facebook page, Gap decided to create an event around the promotion–the Gap Friends Event. Not a bad idea, just not well executed at all. What good is an offer that people don’t know how to redeem? Now, I’m assuming because it’s an event no coupon is needed, but the problem is I’m ASSUMING. Never leave your customers to assume–that’s where problems happen. Your customers shouldn’t have to do work to track down answers, and they certainly shouldn’t be the ones coming to the rescue of your other confused customers. 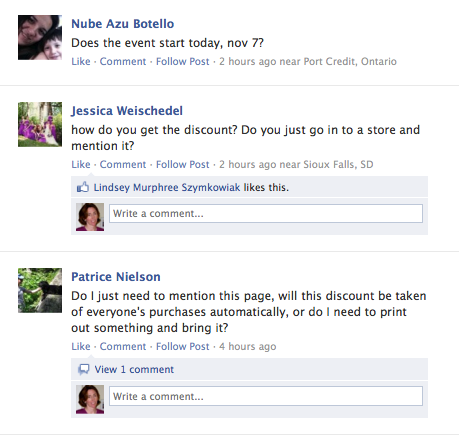 Plus, if you’re going to set up your sale as a Facebook event, draw more excitement around it. Add special deals or prizes for certain actions customers can take on your page, like posting photos of Gap outfits perhaps. If you don’t want to make this special effort, then don’t create it as an event. Just call it a sale and post your coupon on your Facebook page. Simple. Remember, if you’re in charge of creating these promotions, just because it’s clear to you doesn’t mean it’s clear to your customers. Look at it from their perspective, let someone else besides you see it before it posts, and when in doubt, spell it out. P.S. 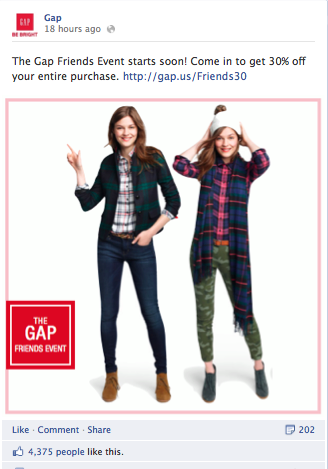 If you are in charge of social media for Gap, you might want to keep an eye out for a new job. Two strikes in two weeks–not good. I had no intention of writing anything about Hurricane Sandy this week. And then this email from Wegmans supermarket landed in my inbox and I had to say something. It’s a shining example of how a company should handle itself when disaster strikes. 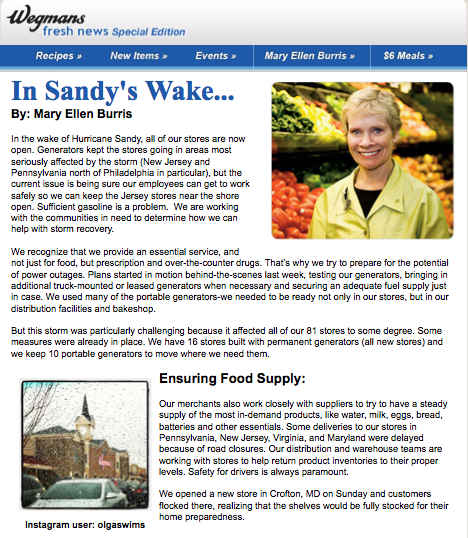 Wegmans sent their “In Sandy’s Wake” email Thursday morning. Rather than explain it to you, I’ll just show you how disaster response should be done. The email came from MaryEllen Burris, senior vice president of Consumer Affairs for Wegmans. In the wake of Hurricane Sandy, all of our stores are now open. Generators kept the stores going in areas most seriously affected by the storm (New Jersey and Pennsylvania north of Philadelphia in particular), but the current issue is being sure our employees can get to work safely so we can keep the Jersey stores near the shore open. Sufficient gasoline is a problem. We are working with the communities in need to determine how we can help with storm recovery. We recognize that we provide an essential service, and not just for food, but prescription and over-the-counter drugs. That’s why we try to prepare for the potential of power outages. Plans started in motion behind-the-scenes last week, testing our generators, bringing in additional truck-mounted or leased generators when necessary and securing an adequate fuel supply just in case. We used many of the portable generators we needed to be ready, not only in our stores, but in our distribution facilities and bakeshop. But this storm was particularly challenging because it affected all of our 81 stores to some degree. Some measures were already in place. We have 16 stores built with permanent generators (all new stores) and we keep 10 portable generators to move where we need them. Ms. Burris hit the perfect balance of information and explanation without overdoing it. The tone is matter-of-fact and caring at the same time. No overexplaining, no making excuses. Burris and management at Wegmans recognized an opportunity to get closer to their customers in a time of need, and created a hashtag to help customers find information they were looking for and connect at the same time. Thanks for being open today… Gives me and my community a step toward normalization… We’ll go to Wegmans, then it’ll be ok–@darcydorwar. Very nicely done. Not only did they stay connected to their customers, but they gave them recognition as well, including sharing Instagram photos users shared with the #Wegmans or #WegSandy hashtag. Notice how non-promotional Wegmans was in their actions so far. The next section of the post-hurricane email included food safety tips, which are so fitting for the many people who lost power for less than a day (and the others wondering what they would’ve done if they had lost power). Discard perishable items that have been above 40 degrees for two hours or more. On Wednesday, I was shopping in Wegmans to fill my empty fridge. As I walked by long, empty produce shelves on one side of the produce department, I asked the two workers scrubbing the shelves there if they lost power during the storm. The young man answered cheerfully that they kept their power but their deliveries got delayed, so they took this opportunity to give everything a good cleaning. Cheerful, compassionate, helpful, informative—I could keep going. But I know I don’t have to. Their actions speak much louder than my words. And I hope marketers everywhere hear them loud and clear.